It is usual to speak about Gomidas Vartabed’s five students, of which Parsegh Ganachian (the author of the arrangement for the Armenian anthem Mer Hayrenik) is the better known. However, his eldest student is frequently left in the shadows. 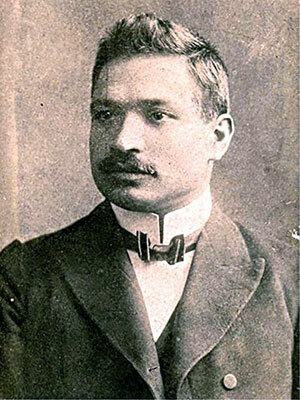 Spiriton Melikian was born in Vagharshapat on December 1, 1880. He lost his parents at an early age and lived with his paternal and maternal uncles. He entered the Kevorkian Seminary of the Holy See of Etchmiadzin in 1893 and soon became the focus of Gomidas’ attention. He followed on the traces of his teacher and dedicated himself to record popular songs. To that aim, he spent his summers in the villages of Etchmiadzin and Aparan. In 1902 Melikian graduated from the seminary and was ordained a deacon. He worked for two years as a singing teacher and assistant to Gomidas in the direction of the seminary choir. After two years of work, he went to Berlin to continue his musical education, following his teacher’s advice. He studied at the private conservatory of Richard Schmidt. Gomidas warned him, however, not to follow the scholastic orientation that prevailed in German musicology at the time. To that end, he loaned him his huge collection of Armenian popular songs to copy and take with him. That providential decision saved the collection from complete loss. Melikian published the only extant copy of Gomidas’ collection in 1931. In Berlin, he studied ancient and modern music history, cultivated his voice, and deepened his knowledge of choral art. He returned to Armenia and decided to dedicate himself exclusively to music. As a result, he severed his links with the Armenian Church and renounced his order of deacon. After a year teaching in Shushi (Karabagh), in 1909 he settled in Tiflis, becoming music teacher and choirmaster at the Nersessian School. In the same year, he published a small book, The Issue of Music Development among Us. He was particularly adamant about the need to dedicate space to Armenian popular songs in school programs. In 1912 he founded the Armenian Musical Society of Tiflis that did prolific work in the promotion and collection of Armenian music during the early 20th century. Melikian and another musician, Anushavan Ter-Ghevondian, published a collection of folkloric music in 1916, The Songs of Shirak. In 1921, after the sovietization of Armenia, Melikian moved first to Etchmiadzin and later to Yerevan in 1923. He became a professor of choral art at the newly founded Music Conservatory, and also taught theoretical subjects, and retrained teachers. He directed the 75-member choir of the conservatory, which also performed in Moscow. In those years, Melikian continued collecting samples of folkloric music and publishing. He became a member of the Institute of Science and Art of the republic in 1926. He organized several campaigns in different areas of the republic from 1926-1932 and published two booklets of Armenian Popular Songs and studies on Gomidas Vartabed. He worked on a book, Outline of History of Armenian Music, posthumously published in 1935. It is said that he collected more than a thousand samples of Armenian song and dance melodies, becoming the most prolific in this field after Gomidas. Spiriton Melikian became director of the State Conservatory from 1930-1933, and was rewarded with the title of Emeritus Art Worker of Armenia in 1933. He passed away shortly thereafter, on May 4, 1933, victim of cancer. He was buried at the Gomidas Pantheon in Yerevan.